Mercury, the small planet that’s closest to the sun, may have once had a surface made of graphite, the material used in making pencil lead. 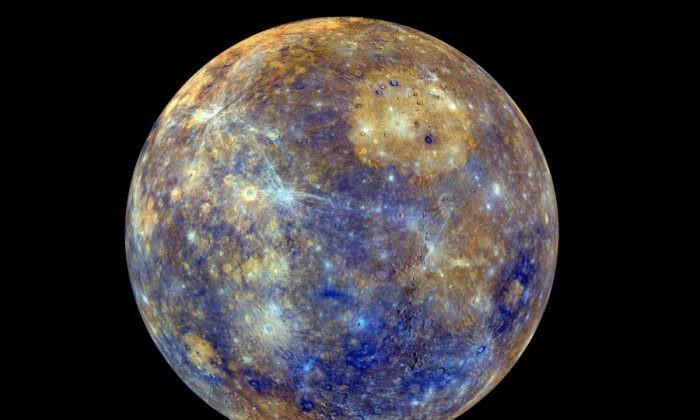 This theory would explain why the surface of Mercury is unusually dark, scientists say. Earlier studies of the planet’s surface befuddled scientists because it contained low traces iron and titanium, the substances that darken the Moon. Carbon, likely in the form of graphite, would be required to darken Mercury’s surface sufficiently. The images were taken when the MESSENGER spacecraft took up-close pictures of the planet from within 6 miles of the surface. Prior images taken at above 120 miles couldn’t detect the carbon deposits. Scientists speculate that Mercury once had a global ocean of magma that allowed the lead to float to the surface. “Experiments and modeling show that as this magma ocean cooled and minerals began to crystallize, minerals that solidified would all sink with the exception of graphite, which would have been buoyant and would have accumulated as the original crust of Mercury,” said Rachel Klima, a planetary geologist at Johns Hopkins. Studies of the composition of Mercury’s crust remains fascinating to researchers because it provides a clue to the early history of the solar system.